An annual award &ldquo;to the player adjudged to have exhibited the best type of sportsmanship and gentlemanly conduct combined with a high standard of playing ability.&rdquo; Winner selected in a poll by the Professional Hockey Writers&rsquo; Association at the end of the regular schedule. History: Lady Byng, wife of Canada&rsquo;s Governor-General at the time, presented the Lady Byng Trophy in the 1924-25 season. After Frank Boucher of the New York Rangers won the award seven times in eight seasons, he was given the trophy to keep and Lady Byng donated another trophy in 1936. 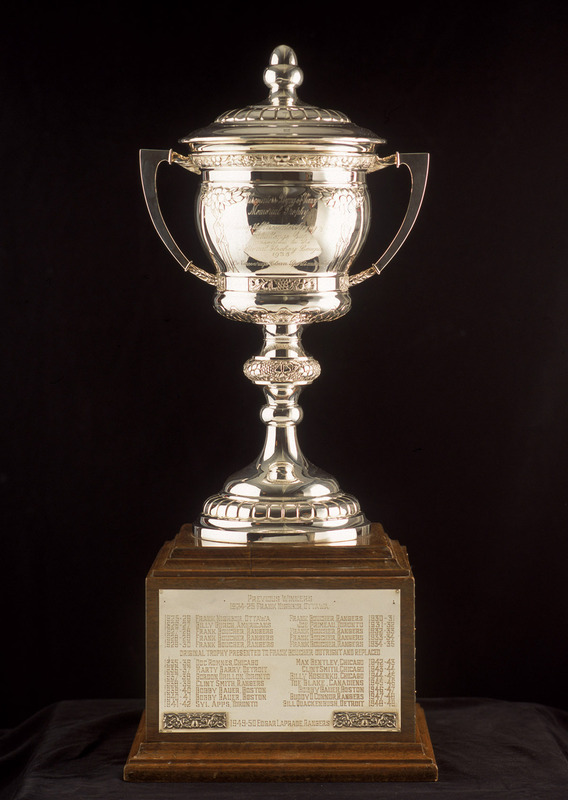 After Lady Byng&rsquo;s death in 1949, the National Hockey League presented a new trophy, changing the name to Lady Byng Memorial Trophy. Anze Kopitar of the Los Angeles Kings was the winner of the Lady Byng Memorial Trophy for the first time. He is the first Los Angeles player to win the award since Wayne Gretzky captured his third with the Kings in 1994. Kopitar polled 817 voting points, including 52 first-place ballots, to finish ahead of Florida&rsquo;s Aleksander Barkov, who had 24 first-place votes and 475 points. Loui Eriksson of Boston finished third with 10 first-place votes and 388 points. Johnny Gaudreau of Calgary had 17 first-place votes, but was fourth overall with 371 points. Buffalo&rsquo;s Ryan O&rsquo;Reilly had 10 first-place votes and 270 points to finish in fifth. In all, first-place votes were spread out among 16 players, including San Jose&rsquo;s Patrick Marleau, who had nine, and four-time Lady Byng winner Pavel Datsuyk of Detroit, who had six. With 25 goals and 49 assists for 74 points in 81 games, Kopitar led the Kings in scoring for the ninth consecutive season, the longest active streak in the NHL, and helped the team set a franchise record with 48 wins. He also ranked second in the league with a +34 rating, matching a career high established in 2013-14. Kopitar totaled only 16 penalty minutes despite pacing NHL forwards in total time on ice (1,690:12) - an average of 20:52 per game. Lady Byng, wife of Canadas Governor-General at the time, presented the Lady Byng trophy in 1925. After Frank Boucher of the New York Rangers won the award seven times in eight seasons, he was given the trophy to keep and Lady Byng donated another trophy in 1936. After Lady Byngs death in 1949, the National Hockey League presented a new trophy, changing the name to Lady Byng Memorial Trophy.